Richard and Robert Sherman wrote the soundtrack to Walt Disney's dreams. Their music is an integral, indelible part of many of Disney's classic films, shows, and theme park attractions. But for the Shermans, success was not always just a dream away. The story of the Sherman Brothers might have sprung from a stock Disney plot: after long struggles and numerous failures, a serendipitous event brought them fame, fortune, and happiness. That event was their first meeting with Walt Disney, a meeting which they left with their heads hanging, as Walt's only comment about the song they played for them was: "That'll work." In Walt-speak, however, "that'll work" was high praise indeed, and the Shermans (or "the boys", as Walt called them) went on to create a musical legacy that millions of Disney fans just can't get out of their heads. 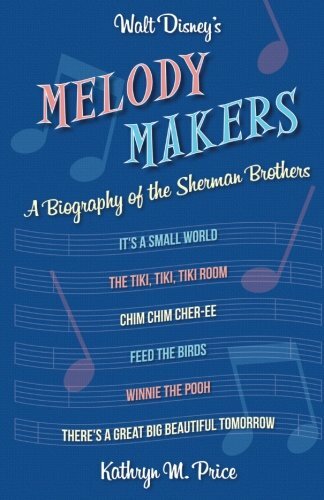 In this well-researched biography, Kathryn Price traces the lives of the Shermans, from their unsettled childhood as the sons of a Tin Pan Alley songwriter and their early failure to replicate his success, to their chart-topping but surprisingly short collaboration with Walt Disney and the long coda to their careers after Walt's death and the transformation of the Disney company into a disharmony they could not tolerate.